After a movie, an anime series now dubbed in English, the little witch Akko from Little Witch Academi is finally ready for her own videogame. Available in Japan since November 2017, the game is finally landing in the West on PlayStation 4 and PC, developed by A+ Games and published by Bandai Namco. Considering how fun the franchise is, is Little Witch Academia: Chamber of Time as enchanting as you hoped it would be? For those of you that are not familiar with the Little Witch Academia franchise, here’s your quick recap. Created byTrigger Studios, known for Kill la Kill, Little Witch Academia is a sort of Japanese Harry Potter anime with an all-female lead and cast. The series tells the story of apprentice-witch Akko, lacking any skills, who joins this school of witchcraft to become a sorcerer thanks to the strength of friendship and a lot of perseverance. And so following the trend initiated by some of the video game adaptations of Dragon Ball, the storyline in Little Witch Academia: Chamber of Time is not a simple repetition of the anime series, but it’s own original story written by the franchise same writer. Our first steps in the world of Little Witch Academia are sadly not that exciting. Now in the midst of the Summer break, Akko carelessly discovers and activates a magic clock in the Luna Nova Academy, which puts a weird curse on the school, forcing everyone to relive the same day over and over again. 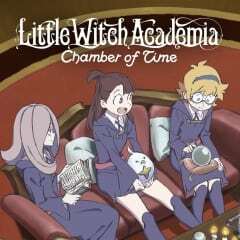 While everyone else in the school seems to be oblivious to what’s truly happening, Akko and her friends set to restore the space-time continuum, by heading to the Horologium Chamber and enter dungeons full of monsters to beat, in hope to eventually repair her mistake. But from the first hour of play, Little Witch Academy: Chamber of Time has a hard time finding a rhythm and tone that suits it. If the script of Little Witch Academia: Chamber of Time is a quirky and comic-relief Harry Potter anime, the gameplay is more or less happy with something out of a PlayStation 2 action-RPG era dungeon crawler. When Akko isn’t roaming around Academy to talk to key characters and find clues for her main quest, she’s battling monsters in the Horologium Chamber, with what seems to be deep RPG mechanics but are simply a beat’em up. Everything you would expect gameplay wise is there, ranging from a normal, medium and strong attack button, a jump, a dodge, and a couple of spells for good measure. Beating enough rooms and monsters in the dungeon will allow you to face a final boss and recover better loot, money and experience points to increase our little witch’s characteristics. Simple, effective, but not original in any way. You’ll be able to form a team of 3 from the total of 7 witches to enter these dungeons. Each of these characters represents a classic archetype of RPG with clear defined strengths and weaknesses. For example, Lotte is the mage with powerful spells but weak in terms of melee attacks, while Jasminka is a tank able to front the lines but has slow mobility speed. The developers at least have remained faithful to the personalities of each character from the anime, and it is very simple to understand the role that every witch adopts in the game if we already know the animated series. On the other hand, it is unfortunate to see that the developers have not paid as much attention to everything else, and notably the technical aspect of the game. Tested on both a normal and Pro version of the PlayStation 4, Little Witch Academia: Chamber of Time suffers from regular framerate drop, which doesn’t help considering how boring the dungeons are in term of design, and how annoyingly rudimental the AI is (whether it is your allies or enemies). While you can counter the latter issue by playing cooperatively online or offline with friends, you’ll realize that this entire gameplay can be exploited by just relying on chip damage, instead of truly grinding and building your character’s stats to defeat enemies and bosses. If the dungeon crawling part of the game was disappointing, it’s the whole cycle to get new keys to access these new dungeons that I liked in a way. These keys are scattered throughout Luna Nova Academy, forcing you to explore from top to bottom and to help students and the teachers as well. I would have hoped to discover the academy and get to know its students in a more magical way, especially when one thinks of all the amazing plots that Akko face during the animated series. The conversations nevertheless, interpreted by the actresses of the anime in original Japanese are a great factor for fans, even if their animations are a bit sad. Little Witch Academia: Chamber of Time was reviewed using a PlayStation 4 download code of the game provided by Bandai Namco. The game is also available on PC in digital and retail releases. We don’t discuss review scores with publishers or developers prior to the review being published (click here for more information about our review policy). Even if it faithfully portrays the animated series' essence, Little Witch Academia: Chamber of Time merge two different game genres without truly making a successful blend. The dungeon-crawling part poses no real challenge thanks to exploitable flaws, and the adventure part is rather simplistic. If you're not a fan of the franchise, I don't expect you will really like the game.